Today has been one of those Mondays. A lot has been going on, I am trying to keep up with everything and now it is late in the afternoon and I intended to get this blog post up hours ago. There will be lots to blog about later this week, but let me give you a quick update on my weekend. I was up to Ponca State Park, http://outdoornebraska.ne.gov/parks/guides/parksearch/showpark.asp?Area_No=143 again this past weekend to help with a Becoming an Outdoors-Family event, http://outdoornebraska.ne.gov/Education/Programs/bow/outdoor_family.asp . The BO-F workshops are something relatively new, I believe this is only the second year we have offered them. They are similar to our Becoming an Outdoors-Woman workshops that I have helped with for years, but the BO-F workshops are designed for families, adults and children. I had a good time, I hope the participants did. Yes, it has been wet in northeast Nebraska too and some of the “camping” out was done indoors to avoid the nightly floods, but all of the activities went on as scheduled. I do not know that I did a very good job of instructing. The kids that were there did not want to listen to me ramble on about fishing or show them how to tie knots or select lures and baits or learn how to cast or talk about presentation theory or the spawning habits of Lepomis macrochirus or anything else that I could have rambled on about for hours. They wanted to go fishing!!!!! So, I tried to get all the kids rigged up and down to the pond to fish and then if I could teach some knot-tying or casting or something else while we were fishing, then that would be great. I hope they had a good time, everybody caught fish, I believe the FIRST FISH for some of them! 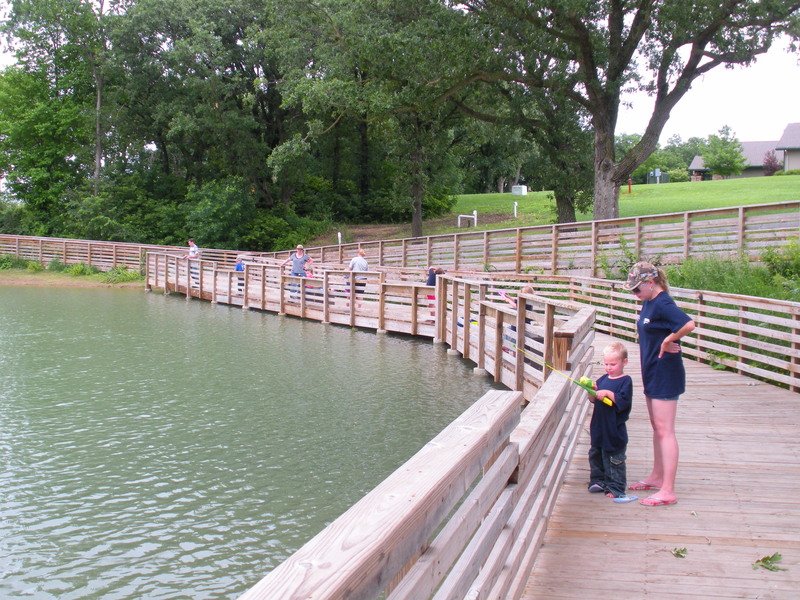 One group fishing along the dock on the Ponca pond. If you have read my blog for any length of time, you have probably heard me refer to fishing with my parents, grandparents, uncles, cousins, nieces, nephews, son, daughter, etc., etc., etc. Spending time in the outdoors camping, fishing, hunting and trapping has always been something we have done together as a family, immediate and extended family, on both sides of my family. Our outdoor pursuits are participation sports and the beauty is anyone can participate and you can participate on many levels. 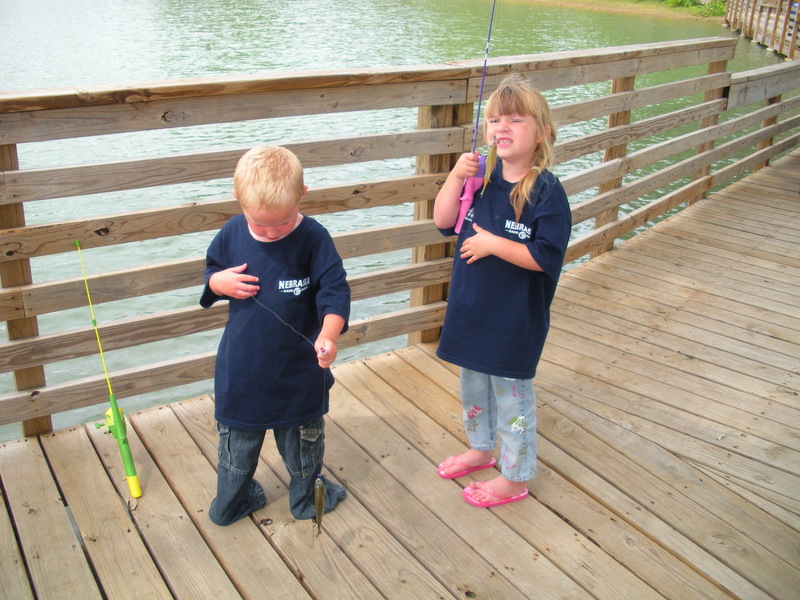 That makes camping and fishing, for example, the perfect family activities–everyone can do it and they can do it together! I know in our busy world folks are always wanting to spend more “quality time” together. You know what? You cannot dictate when that “quality time” occurs by scheduling it on your day planner. The fact is you just have to take time, sometimes lots of time, to be together. When you do that, somewhere, at sometime, sometimes when you least expect it, the “quality time” will occur. I know this much, it is important; it is important to the ones you love and to those who love you. I will even go so far as to say it is beneficial to our society because we need strong families; families that spend time together. I slipped out and did some fishing on my own when I had some free time. I had a spot or two on the Missouri River that I wanted to check, but the water was up a little bit and a little dirty, so that did not pan out. All I got fishing on the river was this picture. I have mentioned some general tactics for fishing high and dirty waters before, https://barbsandbacklashes.wordpress.com/2010/05/06/high-and-muddy/ , but let me tell you what I did once I found the conditions on the river to be less than favorable. A person can catch fish in high and muddy water, but if he or she can find some clear water under those conditions their chances for success likely will be much better. If you can find locations where the water has not become dirty, the fish will likely be a lot more catchable. This past weekend I knew that Powder Creek Reservoir was nearby and I suspected that even if it had received a lot of rain the water would be relatively clean. 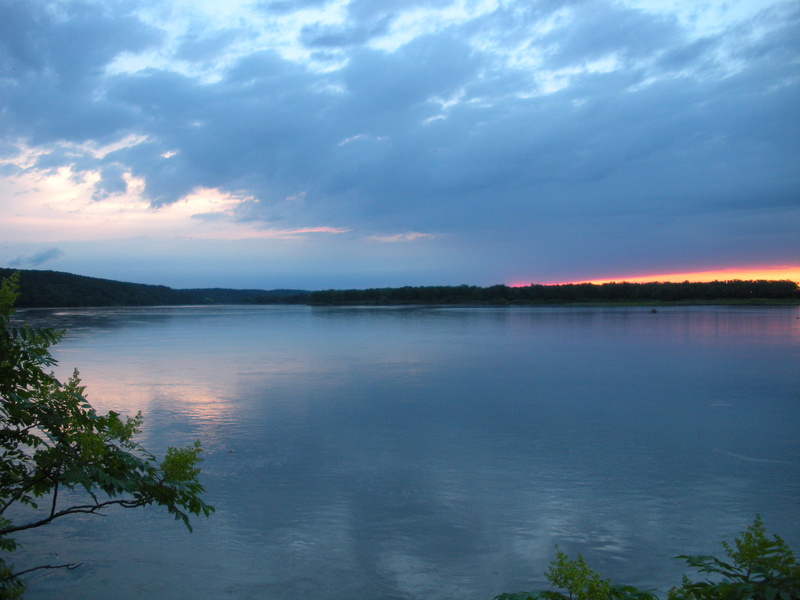 Powder Creek has a good watershed and a lot of features built into the reservoir to maintain water quality and provide fish habitat. So, I slipped over to Powder Creek when I had a little more time to fish and found the water quality to be very good. I only had an hour or so to fish it, but managed a couple of nice largemouths, both about 16 inches. It pays to be versatile and it pays to have different options in mind; I only wish I had more time to spend on Powder Creek. By the way, the bass are finishing up their spawning activities in most parts of the state by now and there is some good fishing to be had. My son and a buddy made a trip out to central Nebraska over the weekend and did very well on some largemouth bass on several different bodies of water.